In the bottom of the ninth, Myrtle Beach (61-43-Overall, 30-23-Home, 20-15-Second Half) slammed a two-run walk-off home run to lift the Pelicans to a 4-3 victory and a series sweep of the Potomac Nationals (48-55-Overall, 23-29-Road, 15-18-Second Half) on The Grand Strand at TicketReturn.com Field at Pelicans Ballpark on Thursday night. The home run by SS Carlos Penalver with 2B Daniel Lockhart at first base off RHP Manny Rodriguez (1-3, 5.60) was his first home run of the season and it nullified a magnificent start by RHP Brian Rauh, who was toeing the rubber for Potomac for the first time since April 21st. Rauh went six innings and offered up just one earned run on five hits, he didn’t issue a free pass and he struck out four. RHP Jeremy Null, just activated from the disabled list prior to the start, wasn’t much worse, pitching five innings, but left on the hook for the loss after giving up two runs on seven hits with one walk and one strikeout. His offense picked him up, leaving Null with no decision for the outing. Myrtle Beach, against Rauh, scored first for the third time in the three game series in the bottom of the third with one out after Penalver singled. DH Chesney Young, who came into the game hitting .370 against Potomac this season, laced an RBI triple into the right-centerfield gap for a 1-0 Pelican advantage. Potomac answered in the top of the fourth against Null. DH Drew Ward and SS Stephen Perez began the frame with back-to-back singles. After a C Craig Manuel sacrifice bunt moved both runners up 90 feet, 2B Khayyan Norfork went the other way with a ground ball to second base, bringing home Ward to tie the game at 1-1 on an RBI fielder’s choice. An inning later Potomac grabbed their first lead of the series when the speedster CF Rafael Bautista led-off the inning with a single. Two outs later, with Bautista at second base, 1B John Wooten extended his hitting streak to five games with an RBI single into centerfield that plated Bautista for a 2-1 P-Nats lead. RHP David Garner entered in the sixth and pitched a scoreless sixth inning before Potomac got him for an insurance run in the seventh. Norfork began the rally with an infield single before moving to second base on a wild pitch. Bautista then singled on the infield, a swinging bunt up the third base line that moved Norfork to third base. RF Narciso Mesa hit a ball on the ground to Lockhart at second base that he threw past Penalver, who was looking to start a twin killing. Norfork scored on the RBI fielder’s choice and Bautista went to third on the throwing error charged to Lockhart for a 3-1 Potomac lead. Garner logged two innings and gave up two hits and one run with three strikeouts. RHP Jake Johansen came in for Rauh in the seventh and pitched a scoreless frame to hold the 3-1 advantage for Potomac. The Merry-go-round began for pitchers in the eighth as Potomac went through three in the frame. Johansen began it, but gave up a single to Young. He then retired the next two batters, one by way of a strikeout before walking 1B Victor Caratini. He was lifted with the tying runs on base for LHP Justin Thomas, who threw one pitch, hitting 3B Jason Vosler and loading the bases. RHP Manny Rodriguez was summoned and gave up an RBI infield single to C Cael Brockmeyer that scored Young and made it 3-2. Rodriguez then got CF Trey Martin to fly out to deep center, a ball that Bautista, with his speed, was able to track down in the power alley to hold the skinny lead. Johansen pitched an inning and two-thirds and gave up one run on one hit, a walk and a strikeout. Thomas was credited with no part of an inning and only the hit batsman. LHP Michael Heesch (8-1, 2.12) pitched a scoreless eighth and ninth innings, facing eight men and allowing two singles in the ninth but stranding both Potomac runners on the base paths to keep it a 3-2 lead for Potomac. Rodriguez stayed in the game for the ninth and walked Lockhart on five pitches to bring up Penalver. After falling behind 2-0 to the shortstop, he delivered the fateful pitch that was deposited into the left field stands for the game winner that sealed the sweep. Myrtle Beach homered in every game of the series (four total) and has hit 15 home runs against Potomac in 2015, while winning seven in a row against The Red, White and Blue. For Potomac it’s the third walk-off loss they have suffered and they end their six-game road trip 3-3 after sweeping Salem at Salem Memorial Ballpark on the front end. Tomorrow night Potomac opens up a three-game series at The Pfitz against the Salem Red Sox. Potomac will send RHP Reynaldo Lopez (5-6, 4.62) against RHP Kevin McAvoy (5-9, 4.40) for the Sox. 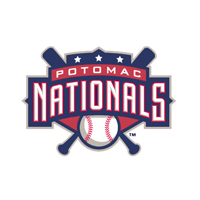 First pitch tomorrow night is set for 7:05 pm and Nationals baseball will be on the air at 6:50 pm starting with the “P-Nats Lead-Off Show” on the Potomac Nationals Baseball Network. You can listen live via The TuneIn Radio App or at www.potomacnationals.com. Tomorrow night at Pfitzner Stadium is Hog Night, an all-you-can eat hog menu from 6 pm until 7 pm for $15. It’s also Back-To-School Drive courtesy of HomeAid Northern Virginia and Kids Run the Bases provided by Glory Days Grill.